Hello fellow! Back again with a genetic curiosity. Today, milk will be the main character. From the beginning, humans and milk have been very related. In addition to the appropriate amounts of carbohydrate, protein and fat, breast milk also provides vitamins, minerals, digestive enzymes and hormones. All what is needed by babies. But when we arrive to adulthood the thing changes. Some people are genetically predisposed to be intolerant. That happens when they stop producing the enzyme -lactase- that digests the lactose. Also, another factors could produce reversible intolerance, such as gastroenteritis, some drugs -aspirin or some antibiotics, for example-, or some chronical diseases from the small intestine. Does not happen to you too that when you don't drink milk for a long time and then you do it, something strange happens in your bowels? Yes, humans and milk are, as Facebook would say, in a difficult to explain relationship. But what is evident is that milk is useful for us. 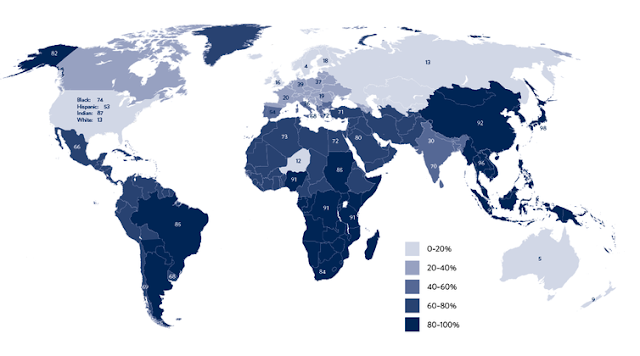 The genetic curiosity comes here when we draw a world map and we distribute the percentages of lactose intolerance. Asians -and also at a lower levels Africans and native Americans- are the most intolerant ethnic. Surprised? Being milk so important, a campaign with different celebrities was made by Body by Milk. Have a look to these videos of Behind the Scenes!